Crash Course Registration Page — Julia Slike & Co.
Michele and I have seen a LOT in our 3+ years online together. We've been working or petooties off what feels like 24-7-365 because we eat-sleep-breathe our businesses. We are in the passing lane. We've learned SO MUCH and have seen what goes on behind the scenes of ''six-figure'' businesses --- good, bad + ugly. And while we haven't earned 6-figures (yet) with our online business... we intend to this year, yay!!!!! We have learned so much we want to share with you about what it REALLY takes to build a thriving online business that fulfills your souls work and makes you a generous income. Because with more MONEY in your life and business, you can help MORE PEOPLE. Everything you want is waiting for you on the other side of your fear and we're going to show you pretty much how to punch that fear in the face. It got you HERE. But it's not going to get you THERE. Are you ready to go get it? For a very special masterclass series we're calling a LIFE + BIZ CRASH COURSE. Each class will be held LIVE on Zoom and there will be REPLAYS, for those who register, because know your are crazy-busy!!! Each class is independent of the other so if you can't fit them all into your schedule, just come to the ones that you can! But to take advantage of this free training you do need to register to attend LIVE or watch the replays. 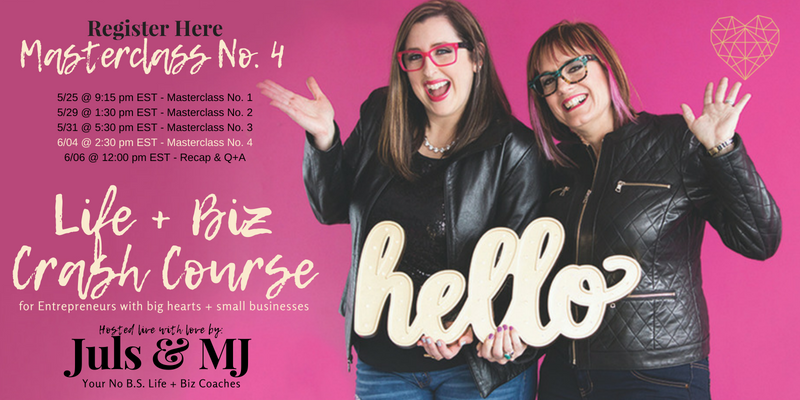 In this candid class you'll get to know the crazy coaches, Juls + MJ, behind this LIFE + BIZ CRASH COURSE – a completely unscripted conversation about online entrepreneurship! Thank you, the replay is loading! This masterclass Juls' teaches you how to create your own Authentic Marketing Map to take your prospects from free content to paying client. Your life and biz will change when you master this personal process! In this masterclass Juls' takes you behind the scenes and shows you first-hand the software + apps she uses to run her business efficiently as a one-woman-show. She shows you over 15 TOOLS you can use for your biz! Register for the replay so that you snag the check-list and guidebook she's putting together for you about what she showed you (and some she didn't). This will save you MEGA time and money, honey! 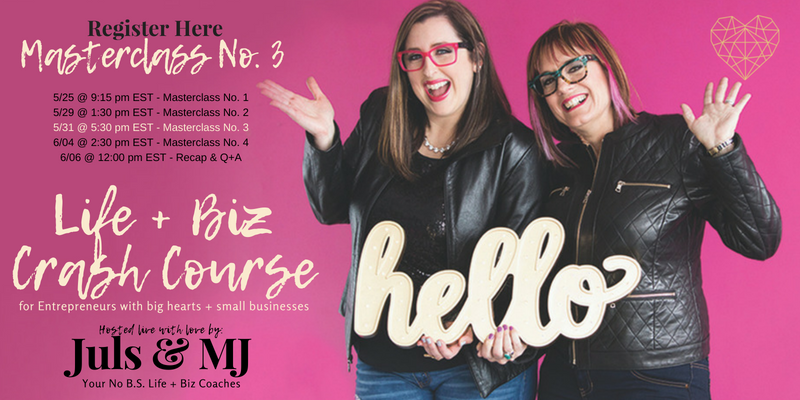 In this masterclass MJ talks about the Julian Method, developed over 20 years of personal life + biz experience -- making taking care of YOU your biz! We invite you to continue your life + biz journey WITH US this summer... we are beyond thrilled to invite you into our Soulopreneur Summer School which begins as soon as you enroll! Note, the official start date is July 1. But when you take fast action we'll start working together for the rest of June! But to take advantage of this free training you do need to register to attend LIVE or watch the replays which will expire at 12pm EST 7/31/18. p.s. if the thought of adding one more thing to your plate freaks you out make sure you download the TAKE ACTION worksheets and brain dump all that shiz up in there to make time for what really matters in your biz!